Tour our website. You’ll find answers to many of the most common questions about chiropractic and natural health care. Check out our getting started video and our current newsletter. We’re a family oriented practice and offer both relief and wellness care. In addition to chiropractic, we also offer massage therapy, laser therapy and custom orthotics services. Many patients begin care in our office with a specific health concern and then realize that chiropractic is all about optimal health… how to get well faster and stay well longer. 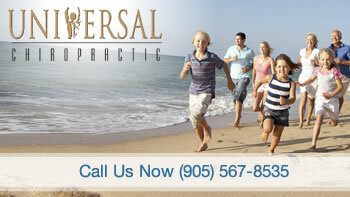 Call our Mississauga chiropractic office today to schedule a no-obligation appointment. Brampton and the Greater Toronto Area how to reach optimal health. Wouldn’t go to any other chiropractic office for treatment. I know that my treatment is geared to exactly what is right for me and my symptoms. The best experience of all chiropractic clinics ever, truly! Consistency is key. I feel very well taken care of and am excited to be on the road to improving my health. I think I’m now on a winning team! I am very happy with the treatment that I am receiving, finally someone took an x-ray to see what is really wrong with my back and neck. Thanks! Very friendly, and a pleasant environment. I truly do appreciate everyone you are all the best. Dr. Suek very knowledgeable and learned a lot. I have been more aware about everyday posture. Friendly staff. Seeing the many people that attend Universal Chiropractor I know I’m not alone. I felt very comfortable and confident with the level of professionalism with everyone in your office. I am very thankful I have taken the time to seek chiropractic care and look forward to the changes to come in my health and well-being. Excellent service. Dr. Suek calmed all my fears about chiropractic care. He was so thorough providing me with knowledge about my spine and the importance of taking care of it. And I am significantly better than when I first arrived. I have found the staff to be very welcoming and the atmosphere very relaxing. I am happy that the doctor can help me and it will be a blessing to be rid of neck/back pain and migraines. I wish I was there before. Great Experience!